2. Product Description : A long Blue roll of Poly Ethylene film on which a pressure sensitive adhesive coating is applied on both sides. Our company holds immense experience in this domain and is involved in offering wide assortment of Plastic Yellow Sticky Trap. Keeping in mind the diverse requirements of our clients, we are engaged in offering wide range of Sticky Traps. We offer products to our patrons as per the need of the application. 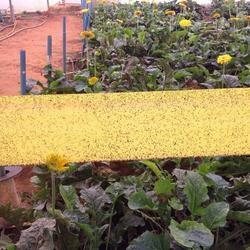 Our products are used for catching pests and beneficial. Customers can avail catch pests and beneficial from us at market leading prices. In tall crops such as cucumber, tomato and pepper, traps should be positioned just above the plant head and raised as the crop grows. For optimal effect against leaf-miner, put traps horizontally on concrete paths. In crops with a low canopy, traps should be supported by canes or wire holders a maximum of 30 cm above the crop. Roller Traps 1. Target Pests : All Flying Insects 2.